Potential trainers  Why Montréal?  What does it take? WHY MONTRĂ&#x2030;AL? Montreal is an inescapable destination. Rich by its diversity, the city will charm you by its various tourist attractions. Each and everyone can manage to find an interest during the visit. Indeed, for the shopaholics, Ste-Catherine Street, on a 15 km stretch, will know how to please you with its numerous stores and restaurants. You will also have the opportunity to discover various districts of Montreal while going shopping. For the sports enthusiasts, the Olympic stadium, known worldwide for its unique architecture is definitely a place to stop by. For the hockey fans, our Bell Center hosts major sport events and concerts, but most importantly, it is home to our national hockey team, the Montreal Canadians. If we didn't manage to convince you yet, the multiple small local stores and restaurants of Chinatown or Little Italy will give you a taste of the diversity of our city. You could dive into a Chinese or Italian universe, only a couple of metro stations away from each other. Our simple public transportation and metro network will allow you to discover many corners and neighbourhoods of this great city. Isn't that amazing? Furthermore, the Montreal Biodome is an experience that will allow you to go through the four ecosystems of America. As a matter of fact, this structure attached to the Olympic Stadium is home to more than 4,800 animals from 230 different species and 750 plant types. Last but not least, Old Montreal merges new and old architecture, a charming atmosphere and activities all year long. We could go on and on about the beauty of Montreal city, but wouldn't it be better for you to come over and discover what itâ&#x20AC;&#x2122;s beauty with all five of your senses? We're waiting for you with our arms wide open! POTENTIAL TRAINERS: WHAT DOES IT TAKE? You want to be a trainer? You want to attend the TNT? We are looking for a polyvalent trainer who can run training sessions. If you are a certified TOT or TNT, please apply! You’re exactly what we’re looking for. Registration is open until January 15th for everyone. We sadly can’t offer registration discount for international delegates nor travel grant. However it will be our pleasure to warmly welcome you in Quebec. 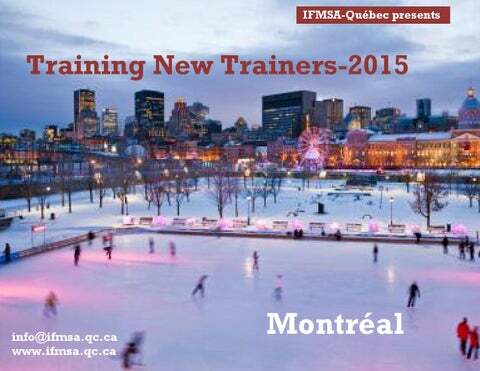 Please note IFMSA-Québec will offer a 500$ travel grant to the selected trainer, an accommodation free of charge and free registration for the event. Curriculum Vitae (maximum 2 pages) Letter of motivation (maximum 1 page) o Objectives o Past experience Visa confirmation (if needed); all the participants & trainers are responsible for the visa procedures. Please visit http://www.cic.gc.ca for more information. Deadline to send the documents to president@ifmsa.qc.ca is: December 15th 2014. All the candidatures will be reviewed by IFMSA-Quebec’s Executive Board with some input from our training division members. For any other questions or inquiries, please drop us an email at president@ifmsa.qc.ca. We promise we’ll answer you in the shortest delay! Stay tuned of IFMSA Official Servers and/or follow our Facebook page at www.facebook.com/ifmsaquebec for more updates! LOGISTICS & PROGRAMMING Dates The TNT will be held January 30th to February 1st. The event will start late afternoon on the 30th and will end late afternoon on the 1st. During those three intense days, participants can expect up to 24 hours of high-quality trainings. Expected number of participants We are aiming to attract between 20 and 30 participants, but we have the capacity to accommodate many more at our venue, should the need arise. We therefore also invite members of NMOs in the Region, and across the world to participate if you are interested in a Quebec experience. 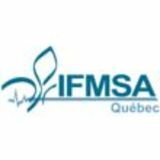 Any IFMSA student that would happen to be in Québec or that could make it would be enthusiastically and warmly welcomed by the IFMSA-Québec Organizing Committee. Registration fees Budget is yet to be finalized, however participants can expect to pay between 40 USD and 60 USD for the weekend, including food, accommodation, material, transport and t-shirts. We will be able to confirm the final registration fees at least one month prior to the event. It’s mostly dependant on the fundraising outcome. .
Accommodation As mentioned previously, each trainer or IFMSA member will be welcomed to stay at an IFMSA-Québec’s residence in Montréal (cost is included in the registration fees). Weather Weather in February in Quebec is usually between -5oC and -10oC. However, one should not be surprised if the temperature drops to -20oC during the night. Pack accordingly! Thank you! Looking forward to welcoming you this January 2015 in Quebec! KEEP TRAINING, KEEP ROCKING !